Does forage quality pay? Absolutely, it pays in many ways for different situations. It may help produce the maximum return through high milk or meat production; it may increase breeding success; it may help a producer allocate different pastures or forage lots to the appropriate animal group, or it may help get higher prices for hay that is sold. It may be that a producer, upon finding out the forage quality of his hay, will decide to feed the best to animals most needing protein and energy, or he may decide it is most profitable to sell the best and feed the rest. Further, in different situations, the producer may look for different forage quality parameters to help determine the most profitable way to use pasture, hay or silage. Forages are analyzed to estimate dry matter, protein, energy and intake. Dry matter may indicate whether a forage can be stored or should be fed immediately because it will spoil in storage. In some situations, protein may be a limiting factor and forages with higher protein may be most profitably allocated to specific animal groups. In most situations, though, energy and/or intake are the first limiting factor and valuing forage based on one or both estimates will result in greatest profitability. Thus, there is no one answer to how much forage quality pays because of the different ways value is achieved. Following will be three examples of the value of forage quality. Milking dairy cows have the greatest need for energy and protein of any animal category due to the large volume of milk produced. Greater levels of milk production per cow are generally more profitable due to the greater return in comparison to the fixed cost of maintaining the cow and facilities. Getting the most milk from a cow is a delicate balance of intake and matching energy, nutrient and fiber needs. Table 1 shows the milk response of dairy cows from different levels of alfalfa forage quality with different amounts of concentrate in the ration. For any level of concentrate in the ration, higher quality forage produced more milk. This occurred because of the higher energy content of high quality forage and, also, because as forage fiber (NDF) is decreased the animal, animal intake increases. Thus, higher quality forage, not only contains more energy, but also allows the animal eat more. Both factors increase energy intake and total milk produced. A second point of great importance from Table 1 is that, while adding grain could offset some of the reduced milk production from lower forage quality, the additional concentrate could not eliminate the effect of lowered forage quality. 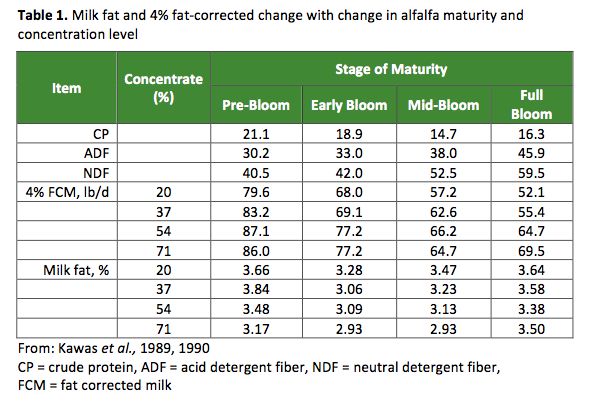 For example, early bloom alfalfa with 54% concentrate produced almost as much milk as pre-bloom alfalfa with 20% concentrate, but no amount of concentrate would produce over 70 lb of fat corrected milk from mid or full bloom alfalfa. Further, the 71%-concentrate formulations are not sustainable, due to animal health problems associated with low fiber. It is also important to recognize that fat concentration of the milk fell (Table 1) as concentrate increased. This also would reduce profitability to the producer because most milk is sold with premium for fat concentration. So how much was the forage quality worth in this situation? If we figure milk valued at $11.00 per cwt, the value of forage quality based on daily milk production is shown in Figure 1 for each concentrate level. 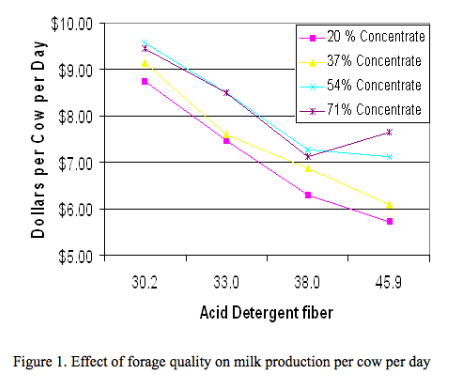 Note that, regardless of concentrate level, lowering the acid detergent fiber eight percentage units (from 38 to 30.2) increased income per cow by more than $2.00 per day. This means that the value of milk produced per ton of forage ranged from approximately $115 to over $300 per ton of hay, increasing with forage quality and as concentrate percentage increased in the ration. A second example of the value of forage quality is shown in Figure 2 where the increase in average daily gain of stocker cattle is linearly related to profitability (Schuster et al., 2001). While average daily gain of cattle on pasture is related to many factors, including animal genetics, animal health and forage availability, forage quality plays a key role. This is particularly true at the higher performance levels where rumen fill can become a factor limiting forage intake and, consequently energy and protein. Often forage quality in a pasture system, especially a rotational system, is a function of management, requiring little additional economic inputs. 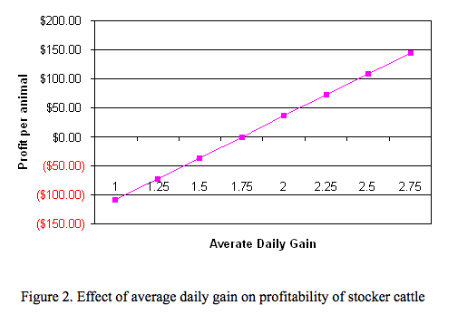 According to this economic analysis, a producer would be losing about $100 per head if average daily gain were 1 lb./d, break even if average daily gain was 1.75 lb./day, and make approximately $140 per stocker if average daily gain were 2.75 lb./d. This great range in profit relating to average daily gain occurs because of the high fixed cost of any operation (e.g., land, taxes, fences, etc.) and because most inputs (other than management) change little as rate of gain increases. Such ranges of average daily gains can occur because of the forage quality of the pasture being offered the animals through better pasture management. 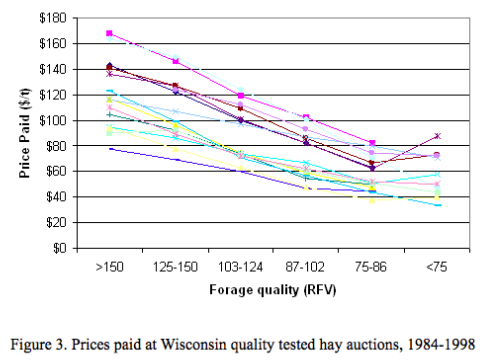 A third example of the value of forage quality is the prices farmers have paid at quality tested hay auctions in Wisconsin (Figure 3.) (Undersander, 2000). These auctions have been occurring since 1984 at various livestock auction sites around the state. Farmers bring in loads of hay during the morning, lots are sampled, tested, and results posted prior to auction in afternoon. Figure 3 shows the average prices farmers paid for different quality lots each year (each line is one year’s results). The total database includes over 15,000 lots of hay. It is apparent that price of hay varied from year to year depending on forage supply and need but that there was always a premium paid for quality. The other interesting point is that the premium paid for forage quality has always stayed about the same, regardless of the base price of hay. We figure the ‘average’ hay is Relative Feed Value (RFV) 100 with a dollar value based on supply and demand, and then consider premiums for quality in the range of 100 to 150 RFV because additional value of higher quality is questionable due to low fiber and high levels of rapidly degradable protein (Figure 4). The value of forage quality has always ranged between $0.83 and $0.91 per point of RFV per ton of hay. If we figure $0.90 premium per point of RFV (to make the math easier), this calculates to about a $45/ton spread between RFV 100 and RFV 150 hay. This price spread has held for the drought of 1989 when average hay sold for $124 and RFV 150 hay sold for $164 per ton and is also true this year (data not shown) when average price of hay is $34 to $40 per ton and quality hay is selling for $85 to $90 per ton. 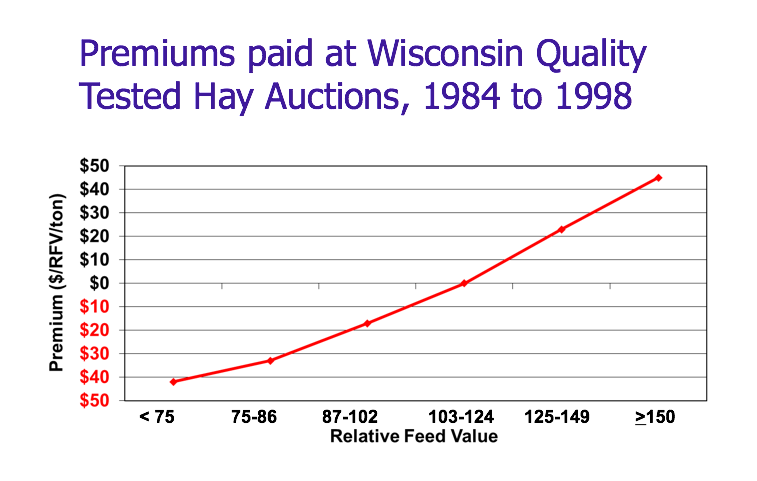 Approximately the same price quality relationship has been noted form the Minnesota quality tested hay auctions. It should be noted that hay form affects price with large round bales selling for about $25 per ton less than other bale types due to difficulty of transport. Medium and small square bales are selling for the same price per ton. All bale types were averaged into the above data. It should also be noted that higher quality hay is more likely to sell or to sell more rapidly in times of hay surplus. Average quality hay is usually more plentiful but of less value and costs more per unit of value to transport. Thus, farmers who have surplus hay to sell may do better in some situations to sell their best hay and feed the rest. In summary, forage quality pays to the dairyman, livestock producer and the hay marketer. It is crucial to achieving profitability through optimum production of milk or meat production. Forage quality can also add great value and salability to marketed hay. Kawas, J.R. N.A. Jogensen, A.R. Hardie, M. Collins, and G.P. Barrington. 1989. Assessment of Alfalfa Quality with Change in Maturity and Concentrate Level. University of Wisconsin College of Agriculture and Life Sciences. Research Report R3460.